Just in time for Christmas! 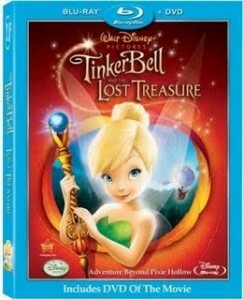 Starting tomorrow (Sunday), you can get the new Tinker Bell and the Lost Treasure DVD Combo for just $5. Awesome! I picked up two tonight, thanks for the heads up on this deal. My daughter loves Tinkerbell! I did this and it worked. First I did have to install software from target.com, and had to go back to the site to get the coupon. The coupon has the transformers picture on it, so that is a little confusing. I really enjoyed this movie, so I was excited to get it for $5! Thanks I did finally find it! Karissa- the Target coupon has the Transformer pictured on it, but it is for any Blue-ray. It was on the first page for me. went this morning and got mine. I am learning (the hard way) good deals like this don't stay in stock long. I can't find it! I've looked for the Target coupon 3 times & cannot find it. Any suggestions? I was there today and found Barbie Swan Lake and Bob the Builder DVD's for $5 each, no coupon needed. I clicked on the Target coupon for the movie and then it said I had to load some software and it would close the internet and then when I went back on the coupon for a movie was gone!?? ?